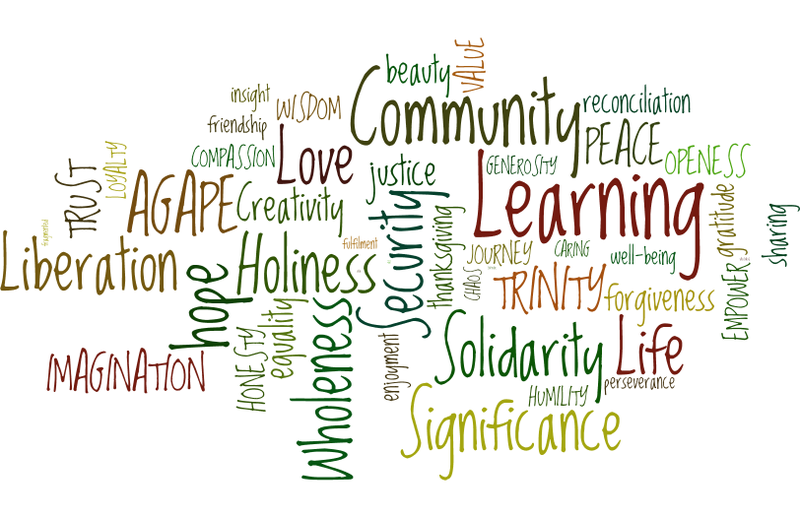 “Communal holiness is that divine gift which, embodying the kingdom community’s gifts of life, liberation, love and learning, transforms humankind into whole persons, whole families, whole institutions, whole cities, whole societies and one world, and points towards the integrity of creation.” (Jane Craske 1999a). With its over use in everyday language, being tagged on to community schools, community hospitals, community projects it may be that the word community has lost its true meaning. What do we truly believe is community and are we part of it? With the changes in society and the movement of people away from the towns and countries of their births there has been felt a loss of identity, of belonging. There is little emotional attachment to the place where you live and that is one of the main factors in the sense of “community “being lost. Although moving away can give new opportunities and experiences it can also leave you feeling socially isolated, without your familiar surroundings you may feel lost. Many try to regain that sense of belonging, the sense of security, of finding that place where you feel “at home”, of being part of a community. We as members of the body of Christ have a responsibility to look around us, to look beyond the boundaries of our church into the surrounding streets, to those closest to us. We need to see what is right in front of us before we blaze off into the sunset trying to save the world. Often the greatest need can be on our doorstep. Before we can put the world to rights we need to take care of those situations closest to us. Clark (Breaking the mould of Christendom 2005) gives us a counterbalance to the 3’s in the shape of the 4L’s. 4 gifts from the Holy Spirit available to all, Life, Liberation, Love and Learning. God intended us to be caretakers of the world he created, not just of the physical world but also of those who inhabit it. They are both interwoven into its very fabric, we cannot save one without the help of the other. Through God’s grace he intends us to create a “communal wholeness”, a world where boundaries are removed, where equality replaces inequality, where prejudice is replaced by tolerance of religion, sexuality and race. Having read the excerpt from David Clarks, Reshaping the Mission of Methodism (Bakewell:Church in the Market Place, 2010) I feel that we have many opportunities to share our faith and continue the legacy given us by John Wesley. His movement was a commitment to a “holiness project” (Johnson McMaster, 2002). We have the ability and responsibility to share the gospel of Christ, Wesley says “the gospel of Christ knows no religion but social: no holiness but social holiness” (John Wesley, The Works of John Wesley Volume XIV p321 preface to poetical works; Hendrickson Publishers), he worked to remove the boundaries which held us back, even today we are still working on this. Inequalities still exist and the Methodist Church is working hard to bring their concerns to those who need to hear them, and to work with them to overcome these concerns. All these things must be with the church at the centre. We do not abandon the church to become popular and fit into the community but we bring our shared values together for good. We as Christians are called to help each other to grow in faith and we need to extend this love, this support beyond our church buildings, out into the streets, to join with those social groups to see what is happening in the real world. God never meant for the “church” and the wider community to be separate, we have so many concerns and needs in common. Why should we not be joined as one community. To be made whole. Complete. We should take our holiness, our service to God beyond the boundaries of our buildings, into the world He created and work together for unity in His Holy name. The Holy Spirit is present and working in both church and communal spheres, bringing people together, a holy people, a whole people, celebrating life and creation. We are all stewards of God’s creation, we work together, worship together in holiness, in wholeness, one people, one family, one community. This is Wesley’s ideal, this is what he planned for Methodism from the start, to be out among the people. To be real not stuck behind a façade. The young people in our church here in River have been looking at the things which concern us and have taken the opportunity to become involved. The slept out to raise money and awareness of homelessness in teenagers and then they looked at how they could continue to help the homeless in Dover and organised the “Great River Bake Off and Craft Fair” to raise funds for the Dover Outreach Centre. They have looked outside our four walls, seen a need and worked out a way of helping. They are an inspiration to us all. You can make a difference. James 2:14-1914 What good is it, my brothers and sisters, if someone claims to have faith but has no deeds? Can such faith save them? 15 Suppose a brother or a sister is without clothes and daily food. 16 If one of you says to them, “Go in peace; keep warm and well fed,” but does nothing about their physical needs, what good is it? 17 In the same way, faith by itself, if it is not accompanied by action, is dead.18 But someone will say, “You have faith; I have deeds.” Show me your faith without deeds, and I will show you my faith by my deeds. 19 You believe that there is one God. Good! Even the demons believe that—and shudder. My idea of community is reflected in what is commonly referred to as “Wesley’s Rule”, attributed to John Wesley. “Do all the good you can. By all the means you can. In all the ways you can. In all the places you can. At all the times you can. To all the people you can.